Helen Shearer studied jewellery and silversmithing at the Ulster College of Art & Design, Belfast. Whilst at college, she explored the idea of working with porcelain as a wearable medium. 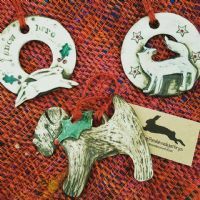 From her workshop set in the Antrim hills, she now produces a beautiful and varied collection of porcelain jewellery and brooches.